There is an enthusiasm in Cleveland Cavaliers coach Tyronn Lue that has replaced the exhaustion from last season. Of course, his job will be far more difficult without the best player on earth, LeBron James, but with the challenge of pushing the Cavaliers into playoff contention. How talented is Lue as a coach? The answer to that question was always cloudy with James present. How many Lue mistakes did James compensate for with his dominance? How many times did James save Lue with a last-second shot or game-winning block? The perception is that these occurrences were often — that Lue was a flawed coach that benefited from the most dominant player of this generation. Without James, Lue will get an opportunity to coach the remaining veterans with some youngsters blended in. Expectations have been dramatically lowered. The Cavaliers could be headed for the draft lottery or, if Lue has his way, they will push toward the playoffs with rookie point guard Collin Sexton leading the way and the re-signed Kevin Love returning to form. The Cavaliers will have the three young players they acquired in midseason trades that were part of the team that reached the NBA Finals — Larry Nance Jr., Jordan Clarkson, and Rodney Hood. Cleveland also acquired former Clippers swingman Sam Dekker, signed ex-Bulls guard David Nwaba, and drafted Alabama’s Sexton, who could be the central figure in their rebuilding plan. 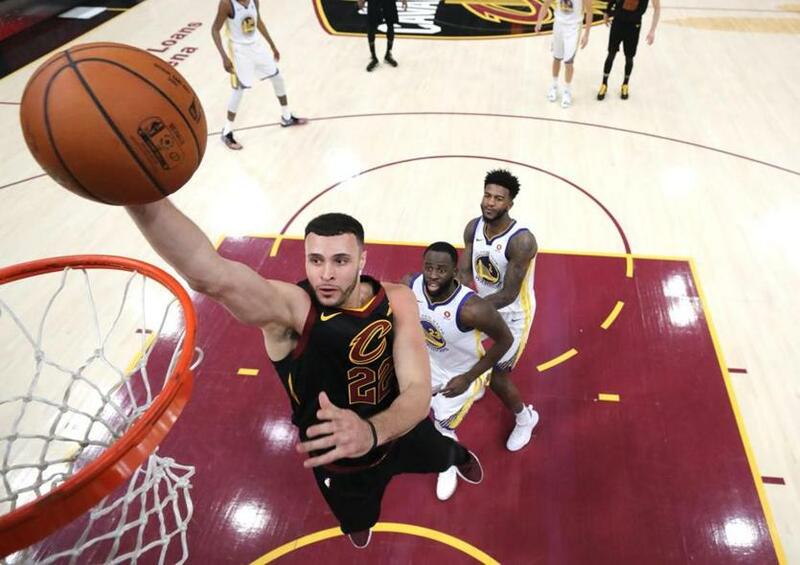 Larry Nance Jr. received valuable experience playing in last season’s NBA Finals. With James leaving the Eastern Conference, the playoff race is wide open. The Celtics are the prohibitive favorites, along with the 76ers. The Raptors, Pacers, and Bucks will make major pushes, leaving three playoff spots for teams such as the Heat, Pistons, Wizards, and perhaps Cavaliers. 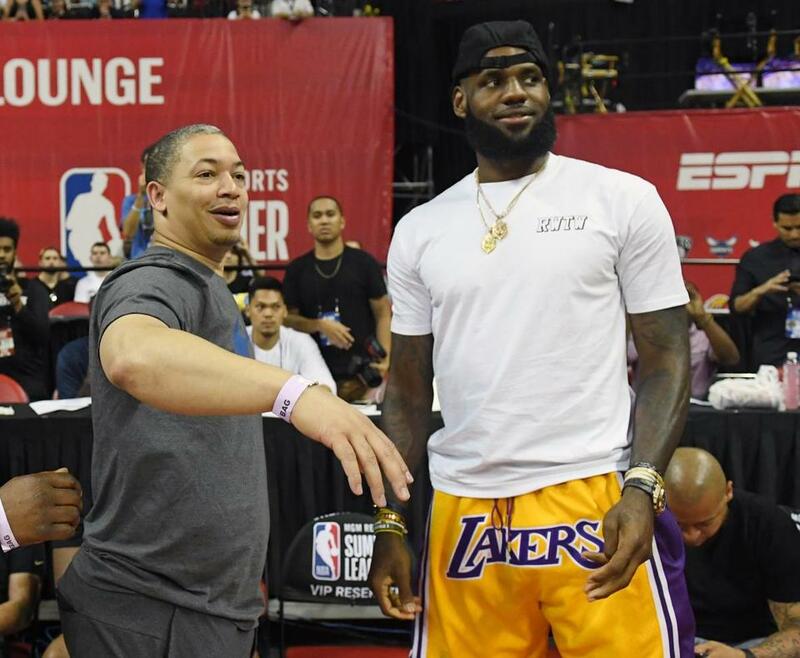 Lue said he did not consider stepping down after this past season, one in which he missed nine games to be treated for exhaustion and other health-related issues. Lue sounds like a coach who has been recharged by the challenge of bringing a franchise back to prosperity from essentially scratch. As he walked past Jerry West after his summer league debut for the Clippers, Jerome Robinson heard West’s voice through all of the ongoing conversations as players came out of the locker room. Robinson recognized West’s voice and looked directly into his eyes. It was West, a Clippers executive and one of the league’s all-time great talent evaluators, who signed off on the team drafting the former Boston College standout with the 13th overall pick. It completed a meteoric rise for Robinson, who was unsure how he stacked up against his draft competition when he decided to declare following his junior season. Robinson, a 6-foot-5-inch combo guard, rose precipitously through draft workouts and suddenly became one of the pieces of the Clippers’ youth movement, along with 11th overall pick Shai Gilgeous-Alexander, a lanky 6-7 point guard. Shai Gilgeous-Alexander and Jerome Robinson are part of the youth movement for the Clippers. The Clippers are in the middle of a major transition after ushering the end of Lob City by trading Blake Griffin and Chris Paul, while DeAndre Jordan signed with the Mavericks. With West joining the front office to help Doc Rivers and Lawrence Frank, the Clippers used both of their first-round picks on prospects and brought back Avery Bradley, traded for Marcin Gortat, and added Mike Scott and Luc Mbah a Moute, making for an interesting mix and intriguing squad in the Western Conference. 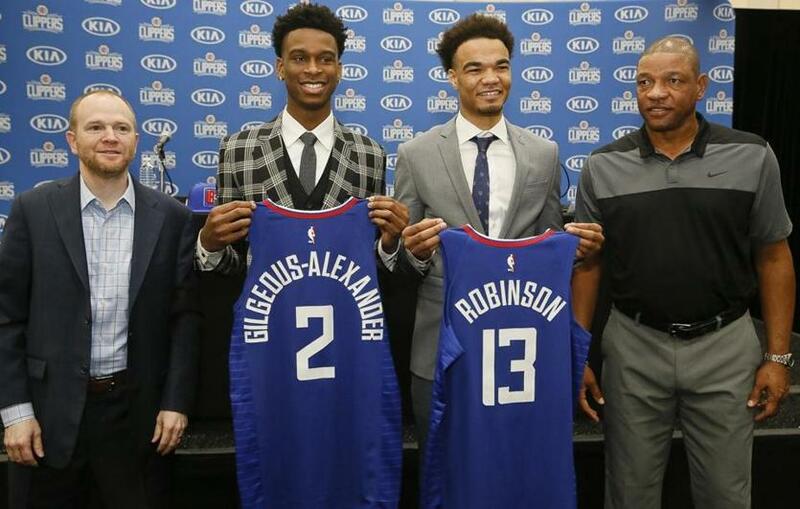 But Robinson and Gilgeous-Alexander are centerpieces of the next generation, with the Clippers hoping they can form a dynamic backcourt. Robinson averaged 20.7 points per game as a junior with the Eagles, leading his club to the ACC tournament semifinals as he and Ky Bowman finally carried the program to long-awaited respectability. Yet, despite the potential to make an NCAA Tournament run, Robinson and Bowman decided to enter the draft. Bowman went back to school. Robinson got the feedback he needed and stayed. But that doesn’t stop Robinson from having thoughts of what-if had he rejoined Bowman for one final run. Robinson cherishes the opportunity to be a building block, especially for a franchise led by such an NBA legend. West said he watched Robinson closely during his junior year and admired his wherewithal throughout his BC career, lifting a downtrodden program to respectability. Robinson is enjoying the early process of being a professional, the first steps to fulfilling his potential. In three games for Clippers in the Las Vegas Summer League, he averaged 13.7 points, shooting 44 percent from the field. It’s been a 12-month climb for Robinson, who considered entering the draft following the 2016-17 season and worked out with NBA players prior to his junior season. The Raleigh, N.C., native, who spent the past three years in Boston, now begins his adult life in Los Angeles. Robinson said he has talked with Rivers often. The Clippers organization has undergone a facelift over the past few seasons. Rivers, who left the Celtics to become coach and president of basketball operations in Los Angeles, was stripped of his president duties and now is just the head coach. Frank is the general manager, and West is the adviser with the championship management pedigree. 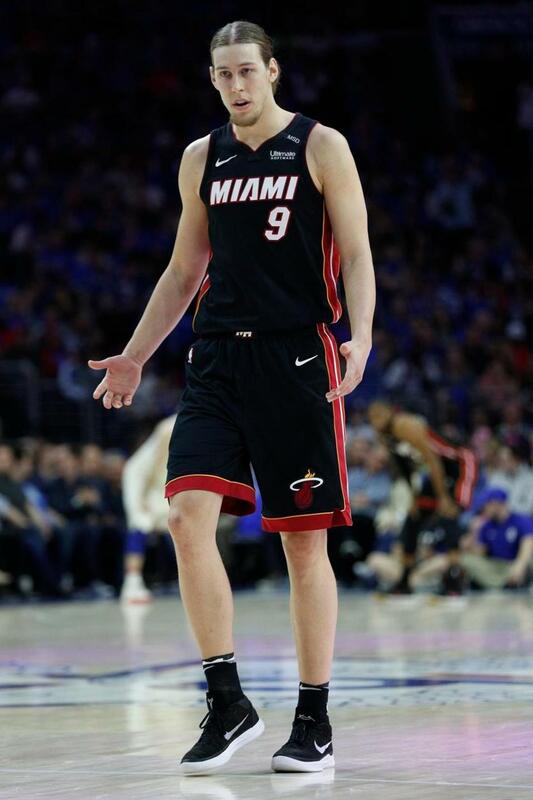 The Heat took a calculated risk by signing Kelly Olynyk to a four-year, $50 million deal after his rights were renounced by the Celtics to create salary cap space to sign Gordon Hayward. But Olynyk’s game developed under coach Erik Spoelstra and he became a versatile scorer and rebounder off the bench. Last season, he averaged a career-high 11.5 points and 5.7 rebounds per game in 23.4 minutes, giving the Heat a reliable bench scorer with the ability to stretch the floor. At age 27, Olynyk has finally found comfort in his role after some rocky seasons with the Celtics. Miami will essentially bring back the same team from last season, but will have a healthy Dion Waiters and a refocused Hassan Whiteside. There is great optimism in Miami that the Heat will take a major step toward contention after being eliminated in the first round by Philadelphia last season. Kelly Olynyk averaged a career-high 11.5 points with the Heat last season. Olynyk appeared to embrace Spoelstra’s rigorous style and burned his former team on a couple of occasions last season, even calling former teammate Jae Crowder to gush after his career-high 32-point performance at TD Garden in December. 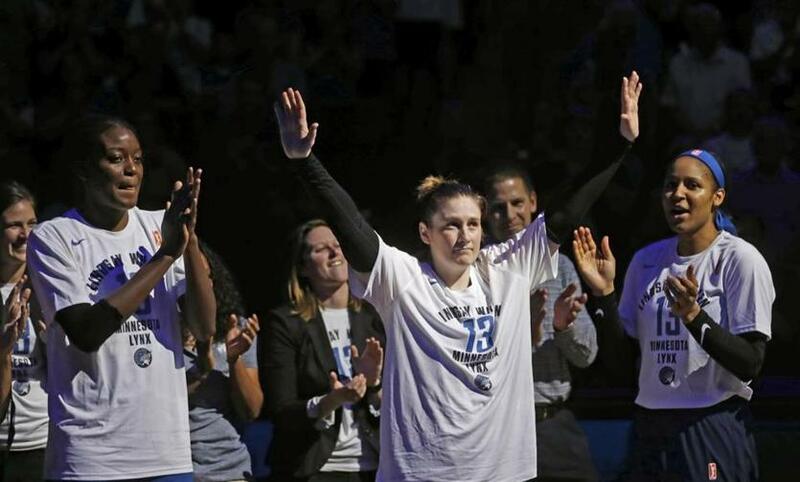 Lindsay Whalen (right) retired as the all-time assists leader for the Minnesota Lynx.
. . . With Whalen retiring and Sue Bird approaching her 38th birthday, the question for US women’s basketball is who will be the point guard for the Tokyo 2020 Olympic Games. The most likely candidate is Skylar Diggins-Smith, who is more of a combo guard, and possibly Courtney Vandersloot, who led the WNBA in assists this season . . . More kudos to the 76ers for hiring former Duke and WNBA point guard Lindsey Harding as a scout. Harding, who actually played for Belarus at the 2016 Rio Olympics, has been an emerging front office executive as the NBA continues to open doors for women in roles traditionally filled by men. Jenny Boucek has been named an assistant coach with the Mavericks and Becky Hammon is an assistant coach with the Spurs. It’s a safe bet that the NBA will be the first major professional men’s sports league with a female head coach . . . Harvard University men’s coach Tommy Amaker announced that former NBA coach Stan Van Gundy will be speaking at the school’s annual coaches clinic on Oct. 28 at Lavietes Pavilion from 10 a.m. to 4 p.m. Van Gundy will speak to area high school and college coaches. Van Gundy was just released from his contract by the Pistons after four years and one playoff appearance. He said he’s unsure if he will ever be hired as an NBA coach again, even though he is interested in coaching another team. After missing the past two years because of a drug suspension, former Bucks guard O.J. Mayo is eligible to apply for reinstatement to the NBA next season. Of course, the league would have to accept Mayo’s application after his drug history. Mayo has been working out in Milwaukee with former teammate Giannis Antetokounmpo. Mayo, 30, had a brief stint with a team in Puerto Rico last season.